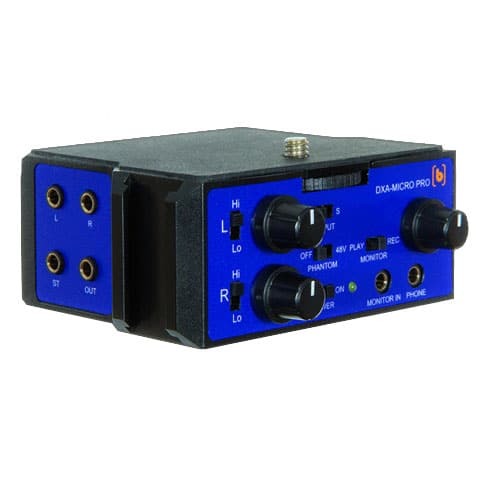 The Beachtek DXA-MICRO PRO is a two-channel active adapter with powerful low-noise preamplifiers, level controls, headphone monitoring, phantom power and plug-in power. It has one balanced XLR input (with Phantom power), two mono and one stereo mini-jack inputs (with Plug-In power). Compact chassis mounts under or over the camera. 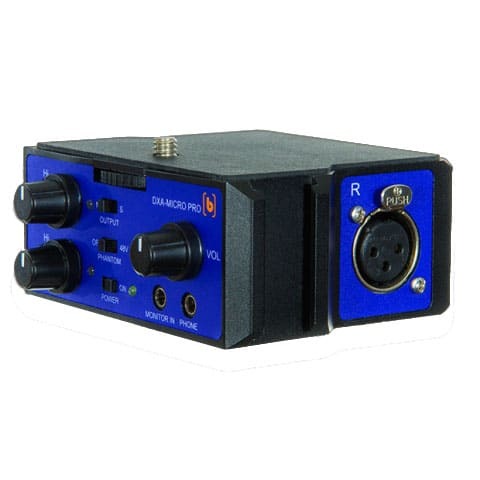 Use it to raise microphone signal levels to usable line level while minimizing the amplification done by your camera. Using an external amplifier is this way reduces ambient noise (hiss) very noticeably, especially in quiet environments. (You may want to refer to our series of blog post on using external amplifiers / mixers to learn more.) Using the external amplifier also allows you to listen to your audio if your camera does not have a headphone jack. This unit works with our premium microphone, our standard XLR microphone, or for the absolute best audio quality, use it with our Equalized XLR microphone.